Gold medal-winning Olympic gymnasts Madison Kocian and Laurie Hernandez became the latest of the Final Five to throw out first pitches for their hometown teams Saturday. Dallas-native Kocian performed a front walkover and then delivered a perfect strike before the Texas Rangers hosted the Houston Astros. Kocian said her dad was actually at a Rangers game when her mother went into labor with her. 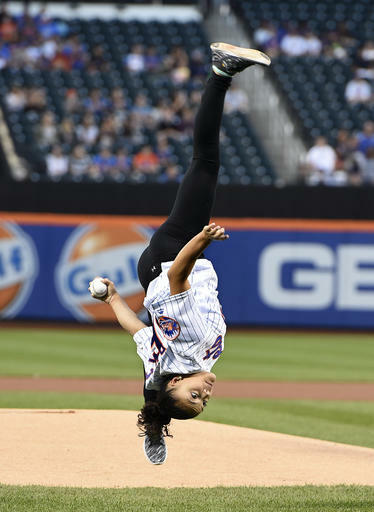 A few hours later, New Brunswick, New Jersey, native Laurie Hernandez threw the first pitch at Citi Field before the New York Mets hosted the Washington Nationals. Hernandez went with an aerial cartwheel before setting and firing. Two other Final Five members, Aly Raisman and Simone Biles, have also already been to big league parks for first pitches this year.